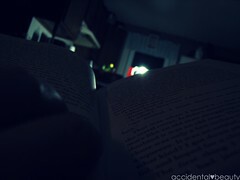 there is something about reading in your house in the dark with no other noise, no television, no dishwasher, and no husband (he was sleeping). i’m almost enjoying no power. Catch me up a little – how do you do your blog? @whall – in what way do you mean by “do?” usually it involves a little sarcasm and a lot of random thoughts that are usually floating around in my head. I have my own pretentious way. I’m wondering how you blog without power. Are you able to do all this from your phone? @whall – either my sister-in-law’s house or work, that’s it.